According to the tradition, a white-haired witch known as the 'Befana' arrives on her broomstick during the night of January 5 and fills the stockings of good children with toys and sweets. The naughty ones, on the other hand, find a lump of coal. Before the Santa Claus tradition of the English-speaking world became the dominant force in the Italian Christmas, January 6 was the customary day to receive presents, not December 25th. The Christian feast of the Epiphany, which falls on the twelfth day of Christmas, recalls the Bible story of the Three Magi arriving in Bethlehem with their gifts for the newborn Christ. Although the good witch of the Epiphany has now been partially sidelined, a recent survey by the Milan chamber of commerce found that one in two Italians still ''feels'' the importance of the Epiphany. The tradition is strongest in Rome and southern cities, such as Naples. Many Italians young and old still look forward to January 6 as a chance to get the presents they wanted but did not receive at Christmas. Parents who find Christmas something of a challenge greet the Epiphany festivities with relief as it means children will soon return to school and there are no more expenses for the time being. Celebrations may be a little muted in any case this year because Epiphany falls on a Sunday. This means Italians won't be able to use the public holiday to extend the weekend and go off on a short break somewhere. Hundreds of events have been scheduled up and down the country on Sunday to the Befana's arrival. 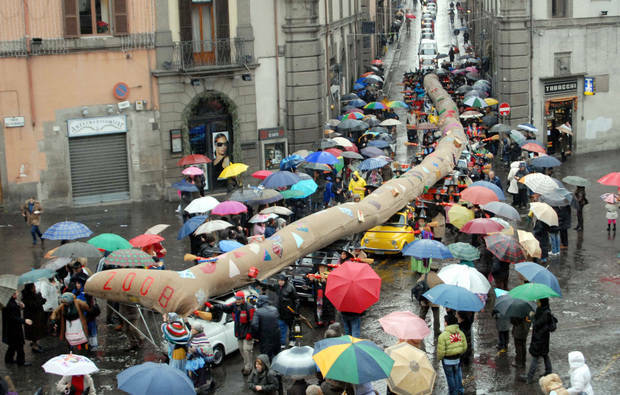 In one novel initiative, the world's longest Epiphany stocking, measuring 52 metres and packed with sweets, will be paraded through Viterbo, a city north of Rome. In Camerino, in the eastern Marche region, there will be another record attempt. A local confectioner is trying to get into the Guinness book of records by making a 400-metre bar of 'torrone', a nougat-type sweet eaten by Italians at Christmas. Back in Rome, Pope Benedict is scheduled to mark the Epiphany with a morning mass in St Peter's Basilica. In line with another Epiphany tradition, a procession of hundreds of people in medieval costumes will walk along the wide avenue leading up to the Vatican, carrying symbolic gifts for the pope.